The Olympic opening ceremony gives each host country a chance to show off some of its achievements, art, and cultural traditions before the Games dive headfirst into sports competitions. It's an incredible spectacle of a performance, rivaling any Broadway, Super Bowl, or awards ceremony production. But many Olympic fans and casual watchers may forget that there's also an elaborate closing ceremony to celebrate the end of the Games. The closing ceremony for the Rio Olympics Summer Games is set to air on Sunday, Aug. 21, at 8 p.m. on NBC and, much like the opening ceremony, it has its own meaning, traditions, and fascinating history. The main purpose of the Olympic closing ceremony, in addition to celebrating the past two weeks of athletic achievement, is to figuratively pass the torch from the current host country to the next. The term "pass the torch" comes from the ancient Greek torch race, in which a lighted torch was passed between runners, and since the modern Olympics are based on the ones that took place in ancient Greece, the torch has become one of the most important symbols of the Games. A real flame is lit at the same spot for every Olympics, at the Temple of Hera in Olympia, Greece, and it is kept burning throughout the Olympics. 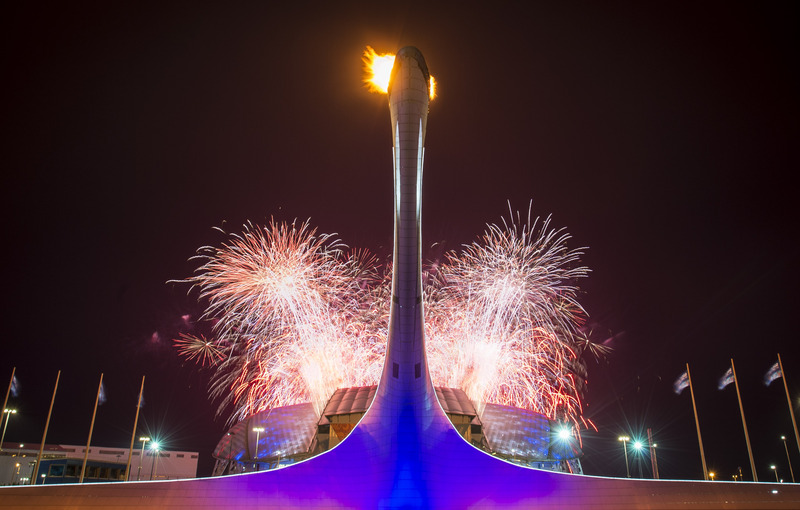 During the closing ceremonies, the torch is extinguished, and the Olympic flag is passed from the current host country to the upcoming one as a symbol of unity, sportsmanship, and world collaboration. Like the opening ceremony, the closing begins with the raising of the host's flag, followed by the national anthem. Next comes the parade of flags, in which each participating country's flag is brought into the stadium in single file. The Olympic athletes, however, enter much differently than they did during the opening ceremony. Instead of marching in by country, the athletes who have stayed for the closing ceremony all come in together, with no delineations or separations. This symbolizes the idea that the Games have brought them together in a unified way, and that they are entering as one nation of the world. This "Peace March" tradition, as it's called, began at the 1956 Summer Games in Melbourne, Australia. It was the first year that other countries had boycotted the Games, athletes were segregated in the Olympic Village, fights were breaking out, and the Cold War tension was rising. According to TNT magazine, a schoolboy named John Ian Wing wrote a letter to the IOC suggesting that the athletes enter as "one multicultural, international affair — with athletes from all the participating countries joining together in unity." The IOC loved the idea, and the tradition has stuck ever since. Once all of the athletes are inside, any remaining medal ceremonies take place. During the Summer Olympics, a final ceremony is traditionally done for the men's marathon, since the event usually ends just before the ceremony begins. At the Winter Olympics, the last medal ceremony is usually devoted to cross-country skiing, although in Sochi in 2014, the final medal ceremony got a jolt of equality when it presented the medals for both the men's and women's cross country skiing events. And once all the medals have been given out, the party begins. While the end of the Olympics can be a somber event, the host city usually tries to spice things up by making the closing ceremony a bit more of a modern celebration, with past and current musicians to perform and plenty of pop culture references. The 2012 London Games' closing ceremony, for instance, featured such musical acts as Jessie J., One Direction, and the reunion of The Spice Girls. The 1996 Atlanta Games' closing ceremony, meanwhile, boasted a dream lineup up of Whitney Houston, Michael Jackson, Faith Hill, Bon Jovi, and B. B. King. The closing ceremony is also a chance for the host country to perhaps humorously reference things that may have occurred during the opening ceremony or throughout the Games. For example, during the closing ceremony in Sochi, Russia, dancers cheekily recreated the incident from the opening ceremony where one Olympic ring failed to open. Those scheduled to perform are usually kept under wraps, but for Rio it has been announced that musician Kygo, who grew up in Brazil, will perform. There's also a chance that Pele, Brazil's most famous soccer star, who had to miss the opening ceremony due to illness, may make it there for the closing ceremony. The final thing that takes place during the closing ceremony is the most meaningful: the passing of the flag and the extinguishing of the torch. First, the Greek flag is raised and the national anthem is played. Then, the Olympic flag is brought down and passed to the mayor of the next host city, after which the flag of that city is raised along to its national anthem. In Rio's case, the Olympic flag will be passed to Yuriko Koike, mayor of Tokyo, host of the 2020 Summer Olympics. This is where some fun and tradition from the next city comes in, as it's the first chance its members will get to present their country and introduce some of their own national performance into the Games. The 2008 Beijing ceremonies were praised for their precision and artistry, but as soon as Rio took the stage at the end of the closing ceremony, they made it clear that their Olympics were going to be a party, with music and costumes reminiscent of Brazilian Carnival. The presentation by South Korea at the close of the 2014 Sochi Games focused more on tradition and elegance, with a lot of the music and performances from Korean children. We don't know what to expect from Japan just yet, but with the Rio portion of the night most likely going the modern party route, Tokyo's segment might tap into some of the lovely imagery, art, and traditional music of Japan. So don't forget about the closing ceremony on Sunday. While it's sometimes ignored because everything already feels over, and many of the athletes have left town by then, it's still a worthwhile spectacle, one that highlights not just the host country but the next country as well. Since it celebrates post-competition global unity, rather than just national pride, the closing ceremony really does capture the essence of the Olympic Games.